You guessed it! 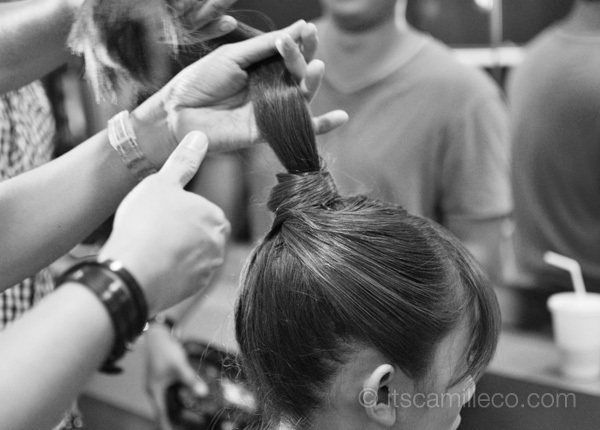 Time for another Stylista x Pantene look with Pantene hair expert Alex Carbonell. This time, the A/W 2012 runway hair trend we’re interpreting is called sleek perfection. It is described as part sci-fi, part Parisian chic. What a combination, right? It’s supposed to give the impression that the hair is aerodynamic and moving at an incredibly high speed. Oooookay then, let’s get started! Honestly speaking, when I first read the description for this hair trend, I really could not imagine it. I mean, when you think “sci-fi”, you think out of this world, extraordinary and probably a little weird. And then there’s the Parisian chic part, which is all about being classic, elegant and simple. How in the world is Alex going to merge this 2 together? Well, he did. I can totally imagine Zoe Saldana in this hairstyle for Startrek. Or how about the Jetsons, Paris edition? Want to recreat this look? Here’s how! 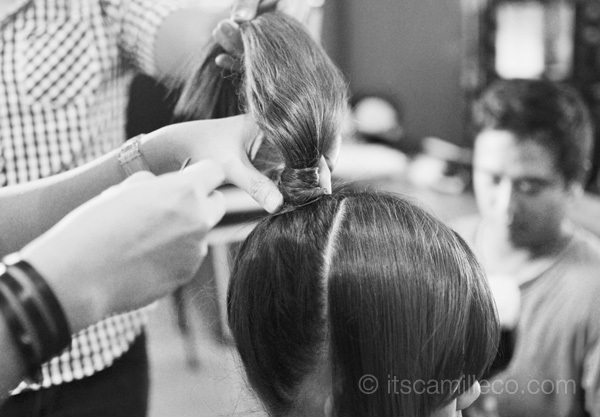 Step 1: Split your hair into 3 sections like this with most of your hair in the center section. 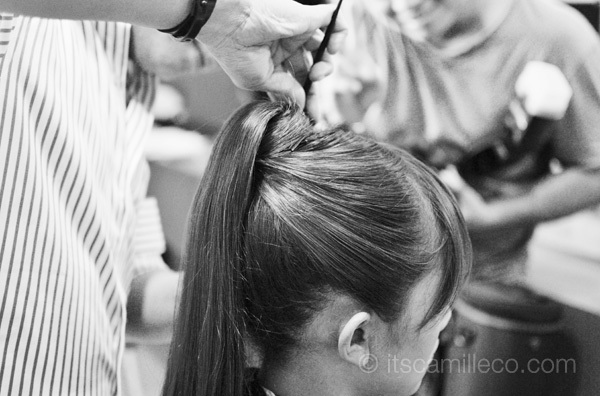 Step 2: Pull the center section up into a tight ponytail. Make sure you pull it up as high and as tight as you can. Step 3: After securing your ponytail with an elastic, get one of the remaining sections of your hair and wrap it around the elastic. Secure it with a pin. Step 4: Do the same with the remaining section and secure it with a pin as well. Make sure you pay attention to the way you wrap your hair around the elastic. The swirl you create from it sort of adds to the sci-fi feel. Voila! Sleek perfection! Now, you have to bear in mind that the most crucial point here is to make your ponytail as high and as tight as possible. You really have to pull your hair up to the best of your ability. This may be painful for some of you because of all that tugging at the roots. It may even cause hairfall especially when you are pinning and tying your hair. To prevent this, make sure you use Pantene Hair Fall control. Stronger hair = less hairfall! Now that we got my hairstyle covered, let’s move on to my part sci-fi, part Parisian chic outfit. Here’s how I interpreted sleek perfection. My take: simple silhouette but bold cuts. The strong shoulders and the unique cut on my skirt modernized my Parisian chic black and white ensemble. It’s not your usual sci-fi-inspired outfit, but who says you can’t make sci-fi wearable? Let’s just say, I’m a trooper going to a disco in Paris? Yes? Pwede? Pwede! I love how Alex and my interpretations match so well. Take note that for all the Stylista x Pantene looks we did, we had no idea what the other had in mind. We went in blind! So far, so good! All his hair interpretations match my outfits so well! I hope you can see by now how your hair really affects your entire look so don’t take your hair for granted. The styling for your hair is so amazing! And with the outfit naman, you got the theme spot on! :) gorgeous! and the skirt, super like. i wish i can wear that. Yes they do! And I like it too! perfect outfit. love your asymetric skirt. Really pretty! You look amazing with your hair tied back into a sleek ponytail. And this skirt looks incredible on you!! i knew it. it was on the tip of my tongue yesterday. hahah! the skirt is so beautiful, and it looked more beautiful on you! I always see Nicole Scherzinger in that hairstyle. =) The hair looked REALLY good on you…perfect. Where did you shoot this? Doesn’t seem like one of the usual places you go to.You probably got a lot of stares when you walked into that building haha! I love your shoes!! Beautiful!! I LOVE THE LOOK! The belt is from? :) Thanks! Wow! I love how you matched your outfit with the hairstyle.